Home › › Anything Else About Dentistry › Bad Breath (Halitosis)? We Have a Solution! Halitosis, commonly known as chronic bad breath, affects millions of Americans. It’s a prevalent but quite embarrassing condition–and despite the various claims of mouthwashes, chewing gums, and sprays, it has no permanent cure. However, regular maintenance and dentist’s office visits can surely help with keeping the condition under control. Doctors have theorized about the origins of halitosis for decades. It was thought to stem from bacteria on the back of the tongue, sometimes bubbling up from deep in the digestive tract. But we know now that halitosis comes from a buildup of a mealy white or yellow gas-forming bacterium, and can originate anywhere inside the mouth, mainly at the gum line area around the teeth, tongue, and tonsils. Some mouthwashes can temporarily reduce the odor, but they don’t break down the accumulation of bacteria, known as biofilm. Teeth-brushing, oral rinses, and tongue-scraping are essential to oral hygiene but don’t get to the root of the problem. 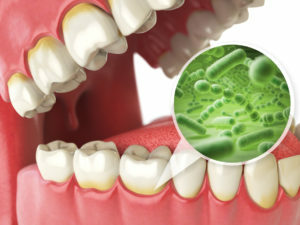 Chronic bad breath is caused by biofilm, the buildup of gas-forming bacteria, and tonsil stones. It’s important to maintain good oral hygiene and visit your dentist regularly for professional cleanings, as part of combating chronic bad breath. This is because the bacteria can form in tiny clumps, called tonsilloliths (tonsil stones), and become lodged in the back of the throat. Fortunately, tonsil removal isn’t necessary to eliminate this buildup. Instead, patients can consult a dentist for a twenty-minute procedure in which the dentist uses a laser to zap the tonsil stones and clear them out. These specialized lasers not only break up the odorous clusters but also end chronic bad breath for an extended period of time. Patients should still always brush, floss, rinse, and scrape the various surfaces inside their mouths, as these routines are all a vital part of maintaining oral and dental health. Performing these hygiene routines daily helps prevent hundreds of types of bacteria from accumulating in your mouth, which can cause discomfort, tooth decay, and halitosis, among other symptoms. And anyone who has neglected to get their teeth professionally cleaned can attest to the complications that arise from plaque and biofilm, ranging from chronic bad breath to swollen gums to tooth decay. Thanks to the application of lasers, the problem of bacterial accumulation–anywhere inside the oral cavity–can be treated with long-term solutions, putting periodontal disease and halitosis on ice! Call our dentistry in Long Island at (631) 246-8080 or in Manhattan at (212) 765-7340 to learn how to PreserveYourTeeth™ and oral health for a lifetime.